This year I was fortunate to have my abstract on Engaging the Gen Y Student Voice accepted at the AIR 2017 Forum and to be included in the affiliated organisations best presentation category. 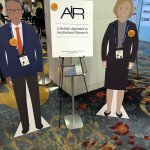 I was one of 27 recipients of the AIR Travel Grants and I gratefully acknowledge the support of AIR Travel Fund and AAIR for the generous support to attend AIR. 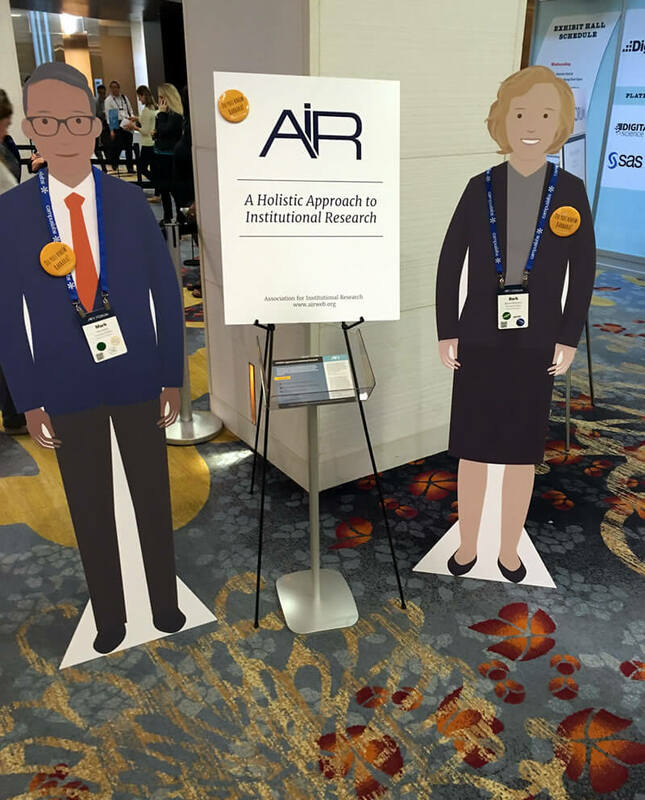 The annual AIR forum is the largest gathering of professionals working in the field of institutional research. 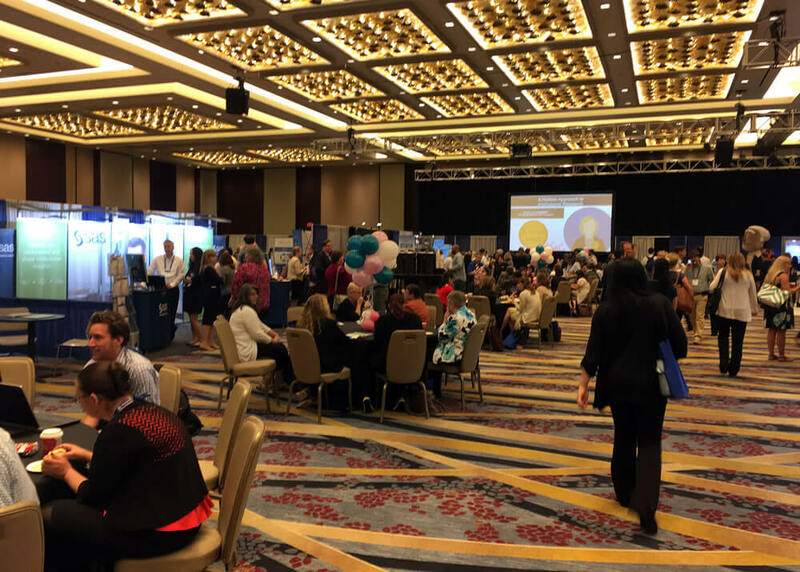 Over 2100 participates attended the 2017 forum which was the largest number to attend any forum to date. The forum was held over five floors in 47 meeting rooms of the Marriott Marquis Convention Center in Washington DC from 29 May to 2 June. The forum attracts participants from diverse higher education institutions across the USA, Canada, South and Central America, the Middle East, Europe, Asia and New Zealand. As expected there was a strong contingent of members representing mostly North American based affiliate organisations. There was also a large contingent from the newly chartered Taiwan AIR. On Tuesday 30 May there were two welcome receptions. The first reception was for those who were attending AIR for the first time which lead into the welcome reception for all attendees. The forum opened on Wednesday 31 July morning with a welcome by Dr Christine Keller the newly appointed AIR Executive Director. She spoke about the future of the profession and AIRs intention to engage members and focus on governance. There were three keynote presentations at forum. The opening keynotes were simultaneous presentations. One from Jeff Strohl from Georgetown University Center on Education and the Workforce talking about our ability to use data to keep up with the flow of data we now have access to very large amounts of data. The other presentation was from Allison Clarke on how to use presentation and listening skills to forge stronger relationships with everyone you encounter. The closing plenary on Friday morning included a keynote address from Talitha William who holds a Ph.D. in Statistics and dual Master’s degree in Mathematics and Statistics. She is the first black women to hold tenure at the prestigious Harvey Mudd College in California and gave a compelling and engaging talk about how data can be used effectively to shape the student experience. For me personally her presentation was a highlight of the Forum. At the end of each day of the forum there were opportunities to participate in a number of dinner groups at local restaurants that were hosted by an AIR member. Each dinner group had a maximum of 20 people who could join and catered to a wide variety of dietary requirements. I lead two of the groups and it was a great way to network and meet attendees working in a similar field in a more casual and relaxed environment. Besides the welcome receptions and dinner groups there were three structured other networking events including a networking reception, dessert break hosted by the sponsors and a documentary screening of “Starving the Beast” a film about the funding or underfunding of Americas public institutions. Sessions and workshops were held each day of the forum from 8.30am until 5.30pm. At each stream 28 to 30 sessions were available to attend. Overall participants had the opportunity to select from over 450 sessions throughout the forum. The logistics for making the most of the sessions was quite complex. However, to assist with planning and scheduling AIR provided a mobile app that helped to plan the schedule of sessions to attend, information about the venue, sessions, speakers and sponsors. The app was a really key tool to making the most of this large event. Throughout the forum there were 15 affiliated organisations “Best presentations” including the presentation from AAIR. My presentation was well attended with about 50 people attending with a number of questions asked at the conclusion. In addition all presentations are available to access and download through a members “Digital Pass” of recorded presentations which remains valid for 12 months after the event. This access enables all participants to access all presentations made at the forum. Each of the presentations I attended had between 30 and 70 people in attendance and all presenters ensured there was time at the end for questions and discussion. In the AIR lounge and Exhibition Hall were 46 sponsors and exhibitors including Microsoft, Tableau, Blackboard, NSSE and Times Higher Education. Sponsors were also listed in the programme book and schedule as well as listed on sponsors boards in the registration area of the forum. All poster displays and social and networking events were also held in Exhibitors Hall. The registration fee (US$450.00) for the AIR forum is comparatively inexpensive compared to other similar events such as our own AAIR forum. The registration fee is kept relatively low as no food and beverages are supplied apart from a farewell brunch during the final key note presentation, tea, coffee, and water throughout the event and cocktail food at the welcome. Lunches, other meals and drinks are the responsibility of individual participants. AIR forward plan for the forums up to 5 years in advance and secure venues, and a number of hotel rooms at the time of booking the venue. This advance booking arrangement means they are able to secure hotel rooms at a greatly reduced rate than that available on booking websites. AIR work to keep the registration fee as low as possible to ensure the forum is accessible to as many people as possible. In the current fiscally tight environment higher education institutions are operating in it is important we work to keep registration fees as low as possible. Attending and presenting at AIR was for me a wonderful opportunity to meet, learn and network with professionals from the field IR. Attending the forum confirmed that the issues of recruitment, retention, using data to make informed decisions, evaluation, relationships with accrediting agencies we face at institutions in New Zealand and Australia are also the same for those in the USA and other jurisdictions. From my discussions and observations it was clear that institutions throughout our region have very robust and transparent systems for collecting and using data to evaluate effectiveness that leads to high quality of the teaching and learning outcomes. We have a strong culture of listening to the student voice and using that information to inform our evaluative conversations that others can hope to aspire to. However, a potential gap in our process, certainly at my institution is in the area of data management and governance policies. This to me is the link that reinforces that value of our as institutional researcher to building a data informed culture within institutions. Having a robust data governance committee that sits at the strategic level of an institution and supported by policies about who are the data experts, how is data used, consumed and stored will become even more important in the growing world of big data.